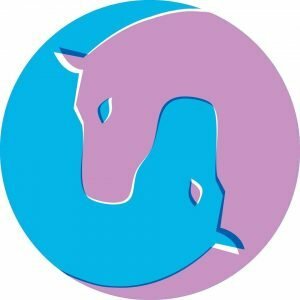 This month we filmed our first dressage test as EquiMind sponsored riders! I put off riding Scottie for as long as possible after our fall at camp, giving my knee as much rest as I could before getting back in the school. However, 2 weeks later it was still quite swollen, even though most of the bruising had gone away. With time running out, I decided to just go for it. My knee wasn’t causing me much pain, I was more worried about not doing anything to make it worse/take longer to heal. There was a lot going on at the yard when I first got on and Scottie was really looking around at what was going on rather than listening to me. Since I didn’t want to push myself too much, I just kept quiet and slowly worked him through it, having a good walk and trot on both reins, so that we had hopefully seen everything. I had had plenty of time to learn Prelim 7, so I knew that there weren’t any tricky movements I needed to think about, so I just focused on being straight and quiet. Scottie surprised me by actually settling down really quickly and despite having had a very minimal warm up and no cantering, I decided to go for it and film the test while he was settled, with the plan to film a second attempt afterwards. The test felt nice, was fairly accurate with some bits what felt really good. I was so pleased with what he had done after having 2 weeks off that I decided to leave it there. When I watched the test back I couldn’t believe how slow we were going, at some points it looked like Scottie was about to stop. It hadn’t felt like that at all and I’m now wondering if Scottie had picked up on my “protect my knee” vibes and had slowed everything down for us. But as I’ve already said, with the circumstances, it was a very nice test, even if I think we are capable of better. We scored 58.4% and placed towards the bottom of the class. I think we were joint 8th with the another ex racehorse! Again, I think the score is a tad mean, but it’s an improvement on our last test with EquiMind and I knew it wasn’t going to be an amazing test due to the time off and my swollen knee. So while I don’t think I would go as far to say I am pleased with my score, I think it’s a fair enough score. Apart from the class winner who had a lead of about 4%, the rest of the class were all within 8% of each other, so a close class. Our scores throughout the test were fair. We got all 6s and 5.5s with a 6.5 for our halt. The comments throughout were about us lacking energy/activity, which I completely agree with after watching the test back. We also had a few comments about not having a consistent outline, which again I expected. She finished by saying that Scottie appears willing and has correct paces, we just need more energy for everything else to come together, which I completely agree with. Despite being towards the bottom of the class, when my test sheet arrived in the post, I was surprised (and very pleased) to see a gorgeous Placed rosette in the EquiMind colours. I thought this was a really nice. 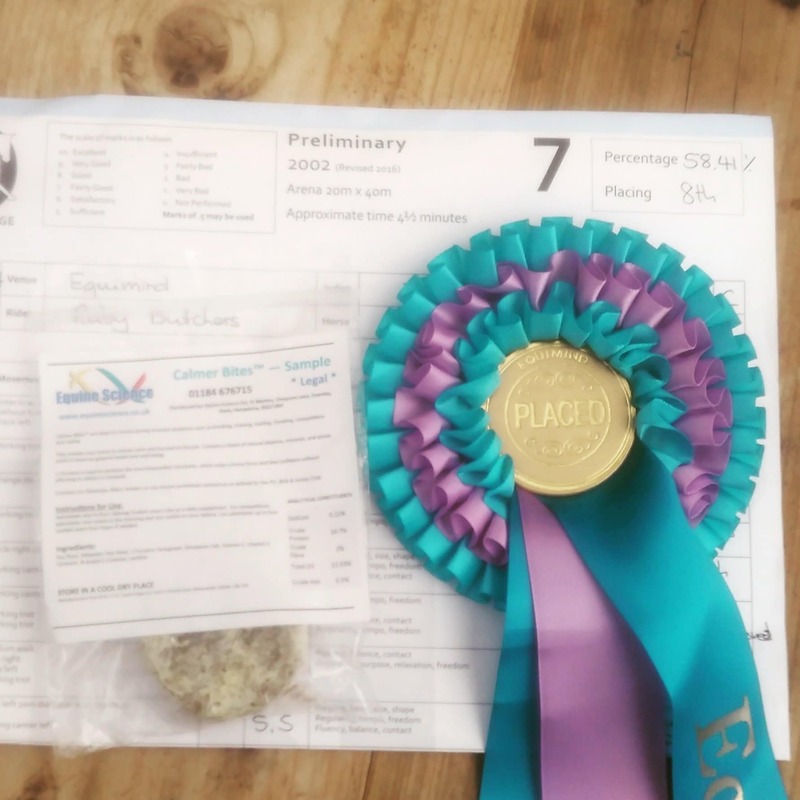 We also received a sample Calming Bite (cookie) which was an interesting surprise but I think is a perfect idea for people competing in online competitions as a big reason for not competing at shows is horse and/or rider nerves! In the future I would love to see an ex racehorse class or league develop, as these have been very popular on other online dressage sites and attract a decent amount of entries. But EquiMind needs to grow more before that can happen but I would love to see this in the future.